The Ceylon Technical College has played an important role in engineering education in Sri Lanka. In the late 1930s the courses at the Ceylon Technical College were only up to the University of London 's Intermediate Examination in Engineering, the equivalent of the present Qualifying Course in Engineering and the Associate Membership Examinations of the three major professional Institutions namely Civil, Electrical and Mechanical Engineering in London. The degree courses were conducted by the three Engineering Departments Civil, Electrical and Mechanical. A University Council resolution in 1945 to establish a Faculty of Engineering in Peradeniya by 1948, which was also the date set for the transfer of the Faculty of Science to Peradeniya, further delays in both the acquisition of land and the construction of buildings. 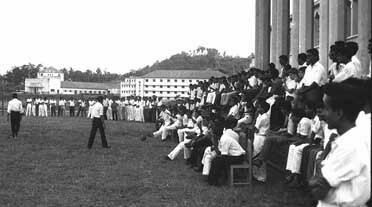 It was subsequently decided in 1947 to establish the Faculty in temporary buildings in Peradeniya in 1950, and the date was again put off to 1952, when the Faculty of Engineering was set up in Colombo. The field of Mechanical Engineering was introduced as one of the major fields alongside Civil and Electrical Engineering in Sri Lanka and Faculty of Engineering established in Colombo had a Department of Mechanical Engineering forms' its out set. A major revision took place in 1969 with all four years of the course conducted in the Faculty of Engineering and examination at the end of each year. The first and second years were essentially the same for all disciplines with specializations mostly in the 3rd and 4th years. The course content was always in step with that in leading international universities. The changes also allowed a little room for specialization by way of a few elective subjects. The BScEng degree from the University of Peradeniya (then University of Ceylon) was accredited by the Institutions of Mechanical Engineers (IMechE), London in 1966 but for various reasons the accreditation lapsed and the degree has since been accredited again by IMechE in 2004. At the commencement of its first academic year on July 1950 the total strength of the teaching staff of Faculty was 12 and 2 of them for Mechanical Engineering. In 1964 Dr. J.C.V Chinnappa, who was the Acting Head of the Department, became the first Professor of Mechanical Engineering. Since then the Department has had major advances. In 1970 the Department had its academic staff …, including Professor S. Mahalingam also was made Professor following the award of a DSc by the University of London. The first ever honors of that kind in Engineering. The staff situation in the Faculty as well as the Department in particular weakened in the 1980s and reached its lowest level in the mid 1990s. The situation has since improved very much with 15 on the academic staff at the point.